The Carpal Tunnel is located at the wrist and is anteriorly composed by a deep arch. The carpal bones and the flexor retinaculum together creates the deep arch. Carpal tunnel is an important site because major neurological, circulatory, skeletal structres pass through it. As the hand plays important function in everyday life, the importance of carpal tunnel increases significantly in anatomical studies. The carpal tunnel is made medially by the bottom of the carpal arch and also it is formed laterally by the tubercles of the scaphoid as well as trapezium. The bridging of area in between the medial along with lateral aspects of the bottom of the arch as well as transformation of the carpal arch into the carpal tunnel is carried out by a thick connective tissue ligament referred to as flexor retinaculum. The median nerve is anterior to the tendons in the carpal tunnel. With the exception of the tendon of the flexor pollicis longus, all the tendons of the flexor digitorum profundus as well as flexor digitorum superficialis are incorporated by simply one synovial sheath: a various sheath encompasses the tendon of the flexor pollicis longus. Free activity of the tendons in the carpal tunnel is assisted by synovial sheaths, which encompass the tendons. The tendon of the flexor carpi radialis is covered by a synovial sheath and undergoes a tubular area produced by the attachment of the lateral element of the flexor retinaculum to the margins of a groove on the medial aspect of the tubercle of the trapezium. The ulnar artery, ulnar nerve, and tendon of the palmaris longus do not pass through the carpal tunnel and therefore go into the hand anterior to the flexor retinaculum in carpal tunnel. The tendon of the palmaris longus isn’t enveloped by a synovial sheath. The radial artery goes into dorsally over the lateral aspect of the wrist and also lies beside the external side of the scaphoid in carpal tunnel. The tendons of the extensor digitorum and extensor indicis distribute an area along with synovial sheath on the posterior side of the wrist. The tendons of the extensor carpi ulnaris and also extensor digiti minimi have specific areas as well as sheaths on the medial aspect of the wrist. the extensor pollicis longus muscle pass through 3 areas on the lateral side of the wrist. Usually afflicting people between the ages of 40 and 60, especially ladies, carpal tunnel syndrome causes tingling and pain in the hand and forearm due to soft tissue swelling and compaction of a nerve at the wrist. The carpal tunnel is the narrow space formed by the bones of the wrist (carpal bones) and the powerful ligament that lies over them Nerves and tendons run by means of this tunnel. 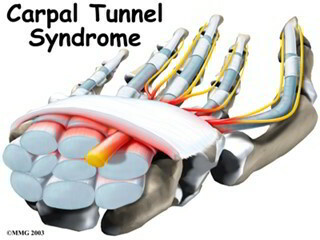 In carpal tunnel syndrome, the median nerve, which controls some hand muscles and sense in the thumb, index and middle fingers, is compressed where it passes through the tunnel. This causes painful tingling in the hand, wrist and forearm and frequently influences both hands. In girls the menopause certainly plays a part, while work including repetitive hand motions is a risk factor in carpal tunnel syndrome. Carpal tunnel syndrome occurs because the soft tissues within the carpal tunnel swell and press on the median nerve at the wrist. Such swelling may happen during pregnancy, as part of rheumatoid arthritis and after a wrist fracture. It may be a characteristic of RSI. In most instances there isn’t any clear cut cause of carpal tunnel syndrome. pain in the wrist and up the forearm. As the condition worsens, other symptoms may slowly appear including: numbness of the hand, weakened grasp, wasting of some hand muscles, especially at the base of the thumb. Symptoms are generally more intense at night, and pain may interrupt sleep. Shaking the affected arm may temporarily alleviate symptoms, but the numbness may become constant if left untreated. The symptoms of carpal tunnel syndrome may be relieved temporarily by Non-Steroidal Anti-Inflammatory Drugs (NSAIDs), or by wearing a wrist splint. Resting the hand and arm on a pillow regularly brings relief. Sometimes a corticosteroid injection under the ligament may reduce swelling. If symptoms of carpal tunnel syndrome continue or recur, operation may be urged to cut the ligament under local anaesthetic and release pressure on the nerve. After operation, most folks have no additional symptoms of carpal tunnel syndrome.